Christmas is truly not about presents... its about presence *smiles*.. Signing off till new year... Hope everyone has a lovely & blessed holiday season!! 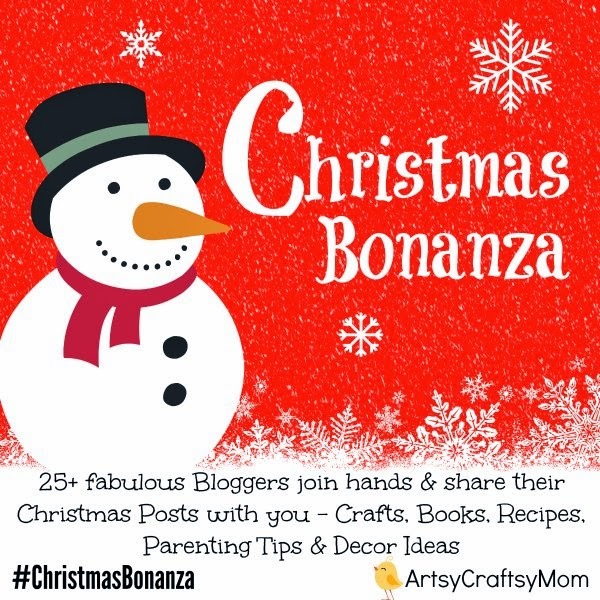 Come join a set of fabulous bloggers sharing their Christmas moments - Easy Holiday Crafts, DIY ideas, Recipes , Decor ideas and book recommendations with you . Starting from today till Christmas and beyond, each one of us will be writing a post related to Christmas. I haven't put up the tree as yet. Just about too much happening in my life... visitors, house guests, parties, weddings, engagements, travel... WOW!! A lot has decided to happen in December *smiles*..
Now walk into the Dubai store with me ... Come on in!!! Last week I was at Lime Tree, and truly it feels like Christmas there! I'm totally inspired by the flying santa idea... Simply cute! Oh.. and they have gift hampers too!! You can create your own or just buy one off the rack!! The goodies inside look impressive!! Now this was my favourite arrangement at the entrance... Look how a few simple things can change the mood of the entire place! By now you know I love these little twines or ropes... Isn't this napkin holder stunning?? and truly its not just the cushions and the succulements.. The food is impresive too. I totally admire the idea of the dessert in a jar... and love everything thats on the menu.. I like the fact that there can be so many healthy options..
As for me... I simply enjoy the variety of coffees here..
You should definitely try it out!! Thats an intersting name for a coffee shop... I thought!! Now Spill the Bean located in Sunset Mall on Jumeirah Beach Road is a coffee shop with a difference. Now just focussing on stunning interiors, but keeping to being green & eco friendly. The coffee shop has lovely interiors.. from standard chairs, to sofas with stunning cushions in lovely colours.. I'm totally loving the little succulents on the tables.. The food was unique too. With a good mix of chocolate, coffee, as well as healthy options for the ones who prefer that.. The menu was truly impressive.. Totally love the little dessert in a jar concept.. Impressed!! If you do happen to pop in here, let me know if you enjoyed it as much as I did! !